I was honored to have the block below chosen for Quiltmaker's 100 Block Challenge V. 3. My block was inspired by my love of mixing traditional styles with contemporary tastes. 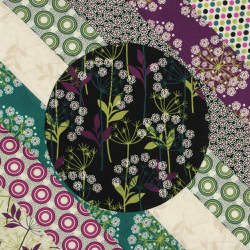 The fabrics I used are part of the Laura Ashley Mod floral collection from Quilting Treasures fabrics. I loved this fabric collection, I’ve made a couple of quilts from it and they all have a different look. The advantages of using EQ for quilt design are endless! long arm machine by Lorna Shepard. I pieced the back because I ran out of fabric. I liked it so much I've been piecing more of my quilt backs for the fun of it rather than necessity.